Here at Albany Subaru it is our honor to provide our customers with great New Subaru Specials and fantastic Subaru Lease Offers. We offer new specials each month so we're sure you'll find the Subaru you've been searching for at just the right price. We have all the latest 2014 and 2015 models from Subaru in our inventory. Our enthusiastic Sales Specialists are knowledgeable and friendly. Their goal is to provide you with outstanding customer service and a memorable and hassle free new car buying or leasing experience. 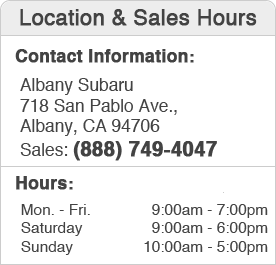 We encourage all residents in the Albany, Walnut Creek, Oakland, and San Francisco, California area who are looking for great specials, and offers on a new Subaru to check out these great deals from Albany Subaru and then come into the dealership for a test drive. We are located at 718 San Pablo Ave., Albany, CA 94706. If you have any questions please do not hesitate to give us a call at (888) 749-4047. We look forward to seeing you at Albany Subaru today!